Kaitlin Young isn’t letting accolades go to her head. “I feel incredibly honored and humbled to be named the 2018 Maine Teacher of the Year,” says Young, a 2010 UMaine graduate in music education. “I am grateful for the opportunity to further the discussion about the importance of education for all students, as well as celebrate and share the great work that teachers are doing all over our state every day,” she says. Young teaches pre-kindergarten through fourth grade general music, as well as choral music to students in grades five through eight in the RSU 68 School District, SeDoMoCha Elementary and Middle schools, in Dover-Foxcroft, Maine. “I started my career at SeDo eight years ago and I have been fortunate to grow with this district and community,” Young says. In October, Young was surprised by her students and colleagues at a school assembly in which she was officially named the 2018 Maine Teacher of the Year. As the Maine Teacher of the Year, Young will travel throughout the state and country collaborating with other educators to support the efforts underway to prepare all students for college, work and civic life. 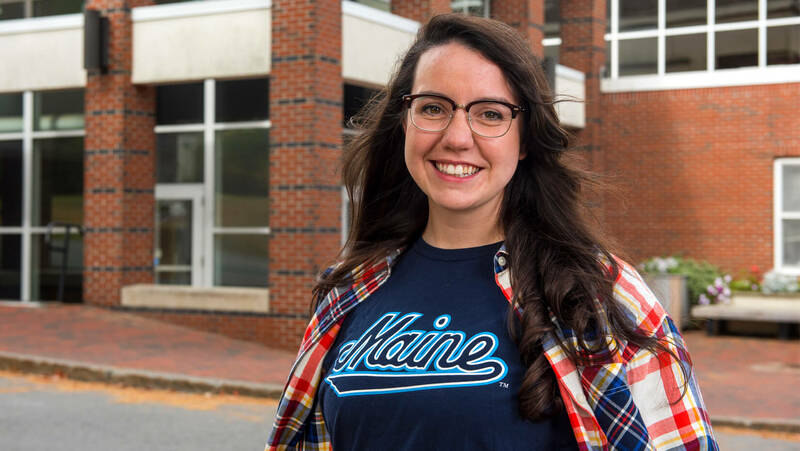 Young, who recently earned her master’s degree in music education from the Hartt School, part of the University of Hartford in Connecticut, credits UMaine with helping shape who she is. 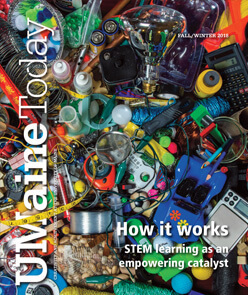 “The University of Maine helped me develop the strong foundational knowledge that prepared me to enter the classroom as an educator and for life beyond college,” Young says. The students and colleagues that I have the privilege of working with each day always motivate me. There is nothing more inspiring than being part of a supportive community that loves the learning process and thrives by asking questions and seeking knowledge. That includes both staff and students. We all benefit from continuing to learn together. It is tough to think of my most memorable professional moment because the best parts of teaching are truly made up of many small moments. There is nothing like an aha moment where students make a connection and take pride in their success, or a question that leads to a great discussion or discovery. Music performances are filled with moments where you see such joy in the eyes of students and their families. When I think about teaching, I think about the little moments that leave a lasting impact. That is why I teach, and why I believe many educators teach; for the connections that we make and enjoy with our students, colleagues and communities. What does it mean to you to be named Teacher of the Year? It is an honor to represent my school, county and state. I have grown up as an educator in my school and the sense of community that we have inspires me. My family and friends, as well as our entire school community, have been celebrating (following the announcement), and I have been overwhelmed and overjoyed at each kind word, card, high-five, hug, etc. It has been a whirlwind, but I could not imagine sharing the experience with anyone else. Do you hope this award will motivate other musicians to go into teaching or for schools to invest more in music programs? How did UMaine prepare you for your career? I loved the camaraderie that grew out of the supportive and collaborative environment within the music program. Along with the pedagogical knowledge, the program is designed to encourage you to build relationships with professors and colleagues that stay with you beyond college. It is inspiring to me to see so many other friends and colleagues thriving. I also love being able to visit with former professors who have become mentors and friends over the last 10 years. They are invaluable resources who have inspired many of our educators across the state. Beyond the academic classes, being a part of many campus activities that UMaine has to offer has shaped who I am as an educator. I loved being a member of the Pride of Maine Black Bear Marching Band, Screamin’ Black Bear Pep Band, and University Singers. These ensembles bring together students from all over campus and teach many of the intangible life skills that students will need to continue to thrive as adults. The “Pride, Spirit, and Drive” motto instilled in me through the marching band is something that I carry with me everywhere I go, and it is what I hope to share and inspire in students. I loved being a part of the entire UMaine community. It truly helped me experience the joy of growing up, learning, and being a part of something bigger than yourself. What’s your most memorable UMaine moment? My most memorable UMaine moment has to be the first time that I heard an arrangement of “Livin’ On A Prayer” played by the Screamin’ Black Bear Pep Band at a hockey game in the Alfond. The arrangement has special significance for me and the combination of music performed by the pep band with the incredible atmosphere created in Alfond Arena at a hockey game is something that I will never forget.